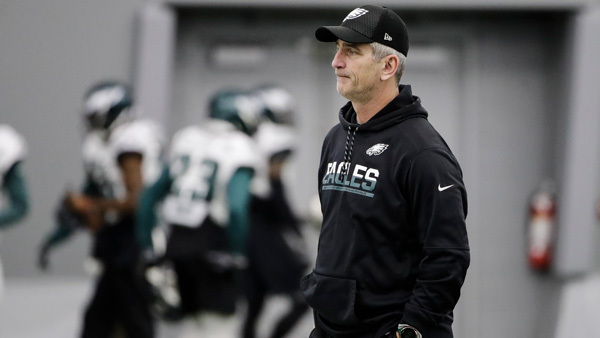 INDIANAPOLIS -- The Indianapolis Colts have hired Philadelphia Eagles offensive coordinator Frank Reich as their new head coach. Team officials made the announcement Sunday. Reich is expected to be introduced at a news conference Tuesday. The move comes five days after the Colts announced New England Patriots offensive coordinator Josh McDaniels would be their next coach. McDaniels backed out of the deal eight hours later. Now, the Colts have hired the man who helped the Eagles outwit McDaniels in last week's Super Bowl. Reich returns to the franchise where he started his coaching career as an intern in 2006 before becoming a full-time assistant in 2008. He may be best known for rallying the Buffalo Bills from a 35-3 deficit to a 41-38 overtime victory over the Houston Oilers in January 1993 - the biggest comeback in playoff history. And now he will be paired with the architect of the second-biggest playoff comeback in Andrew Luck. But Reich also has become a well-respected coach. He joined the Colts as an offensive assistant in 2008, became Peyton Manning's position coach in 2009 as the Colts won their first 14 games en route to their second AFC title in four years. Indy lost in the Super Bowl to New Orleans. Reich retained his title until taking over as Indy's receivers' coach in 2011, then moving to Arizona in 2012, where he also coached receivers. In 2013, he was hired as San Diego's quarterbacks coach then was promoted to offensive coordinator in 2014 where he stayed until joining the Eagles staff in 2016. Now, after having his name bandied about the past couple of years as a head coaching candidate, he'll have a chance to run the show. Reich inherits a team that finished 4-12 last season and needed 41 days and two chances to find Chuck Pagano's replacement. If Luck is healthy, the Colts' job might be one of the most attractive openings this offseason. Luck missed the entire 2017 season after having surgery for a partially torn labrum in his throwing shoulder, going on injured reserve in November because of lingering pain after he started throwing a football. General manager Chris Ballard said Wednesday that Luck still hasn't thrown a football since then. Indy also has a defense that improved throughout the season, the No. 3 overall draft pick in April, nearly $80 million to spend in free agency and a promising backup quarterback in Jacoby Brissett, who started 15 games last season.